How Does Condensation Degrade Insulation? This is what fiberglass insulation looks like after several years in a wet crawlspace. In addition to creating an environment for mold, condensation also ruins the insulation you have in two ways: Wet insulation makes fiber-based insulations, such as fiberglass, ineffective. Moisture also adds weight. Despite support, the insulation sags and compresses. The gaps and openings further degrade performance. In addition, insulation can support mold growth and can sometimes house insects. Mice make their homes in the insulation and leave feces there, causing health problems. They may enter the main area of your home as well. 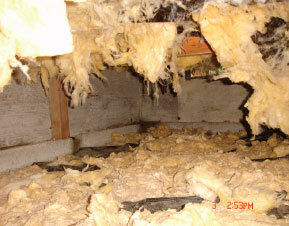 This insulation will fall to the floor from the excessive moisture it absorbs, creating a mess. Without the insulation, the problems of cold floors and poor indoor air quality return. Heating bills rise. Your crawlspace looks like a mess, and it's filled with mold and vermin – all of which will affect the value of your home when the time comes to sell.